SVRG recently volunteered with this group, and we were impressed with how much we learned about bicycle repair in a short amount of time. During our volunteer day, we helped to fix over 45 bicycles for donation, which is a very rewarding feeling. Bad Tempt-Her, an SVRG newbie says, "I couldn’t have asked for a much more structured and valuable day. The team of experienced volunteers were readily available to provide step-by-step instruction on how to D.I.Y. regardless of the complexity of the repair. Not only did I enjoy the restoration process but I was also able to produce fully functional bicycles to people who will appreciate them most. I will definitely be volunteering or donating again in the near future!" SVRG will be back again soon and we hope to see you there! VOLUNTEER to fix up bikes during one of their volunteer service days from 10am to 3pm on the 2nd or 4th Saturday of every month. Individuals and groups are welcome, and if you volunteer 5+ work days during a year you get a T-shirt or shop apron! 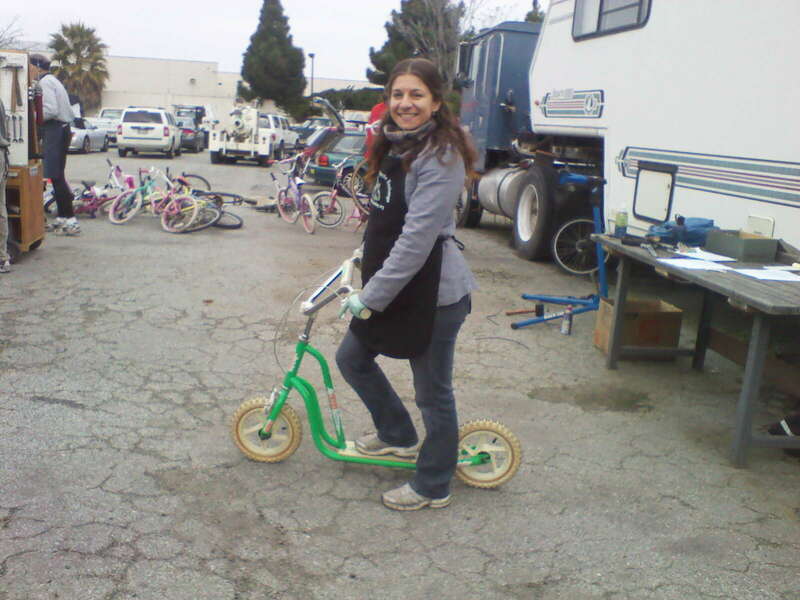 DONATE a bicycle, scooter, tricycle, accessories, or even cash to help keep this great volunteer-run organization going – it’s tax deductible! ORGANIZE a bicycle exchange chapter in your area. The Bike Exchange would like to start up a San Jose Chapter but hasn’t yet found someone with enough time to commit to organizing and running a Bike Exchange Chapter. Interested in helping? Contact them for more info. Visit the Silicon Valley Bicycle Coalition for more information!